The other night I gave a talk to the North Okanagan Naturalists Club: a group of lively, mostly retired folks, interested in parks, birding and botany. Given only half an hour, and asked to cover the spectrum of water issues, I bounced along topics relating to biology and the environment, trying to build a bridge between this nature theme and the nuts and bolts of water management. 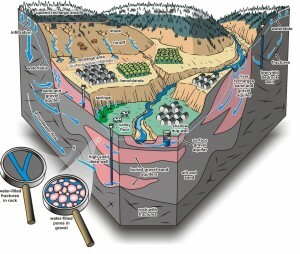 A cross section of Okanagan aquifers, from the Okanagan Waterscape Poster ( see: www.obwb.ca/okanagan_waterscapes). Hands shot up at the end of the talk, launching into a public discussion on natural resources. Rather than fish and riparian restoration, the Naturalists wanted to talk about water agreements with the Americans, Okanagan population growth, and water law. Last week, I attended a workshop in Portland, Oregon, on the future of salmon under climate change. Our delegation had been invited to talk about the resurgence of sockeye in the Okanagan River, and our experiences with collaboration. Scientists, managers, fishers, First Nations, and other friends of fish, gathered from around the north Pacific to talk about good news, bad news, and what’s possible. 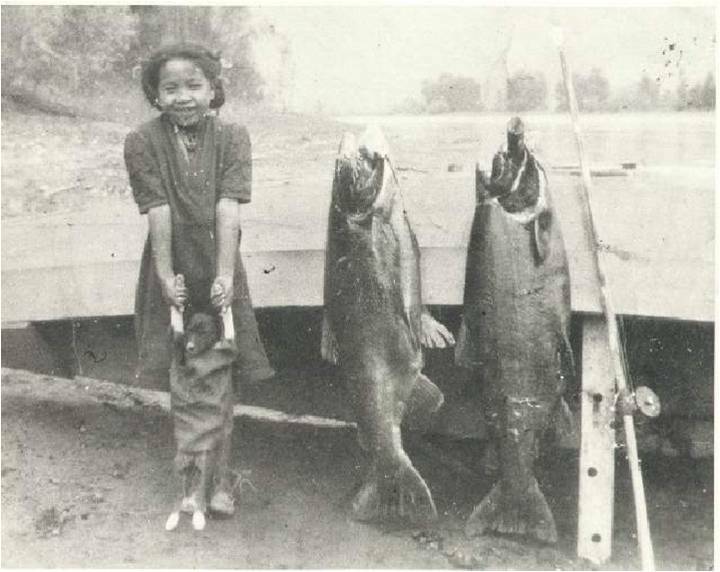 It was a diverse group from far-flung geography, bound together by the need to manage salmon under rapidly changing conditions. And while much of the conversation was focused on science, there was an important thread about values. What we protect and care for depends strongly on what we value as communities. 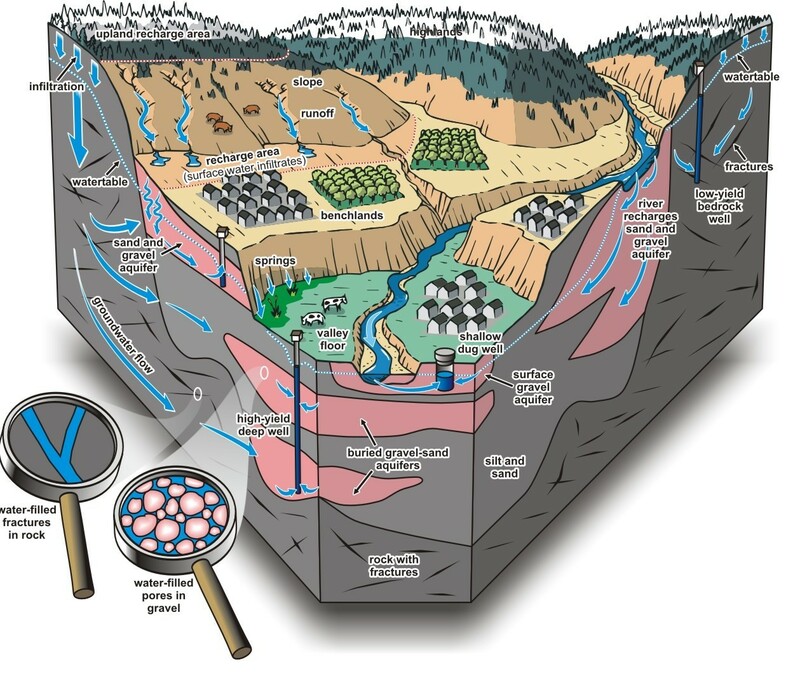 Simple, home-grown solutions for the Osoyoos international water agreement. It is hard to think of anything more controversial than “Americans taking our water.” Questions come up at almost every public meeting. The concerns are not entirely unfounded: in general (as Trudeau famously remarked), living next door to the US is a lot like sleeping next to an elephant – feeling every twitch and grunt. This underlying sentiment, and the need to meet Okanagan water demand and environmental flows while being good neighbours, has created intense interest in the renewal of the International Joint Commission’s (IJC) agreement for Osoyoos Lake. The Zosel Dam, circa 1970 - from the IJC website. In this post, I want to share our “Made in the Okanagan” solution for the 2013 renewal of the Osoyoos Lake Operating Orders for Zosel Dam. 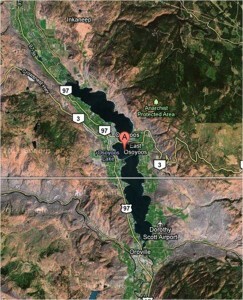 An international watershed board for Osoyoos Lake? The one time I went to a reunion with my grandmother, I couldn’t get over how much these new-found relatives looked just like me (big smiles, round faces). My family had doubled in size overnight. That’s the feeling I had this week at the bi-national Osoyoos Lake Water Science Forum. Our Canadian maps may stop at the 49thparallel, but the basin continues south and includes a larger watershed family. If we are going to use the slogan, “One Valley, One Water,” we have to think bigger. 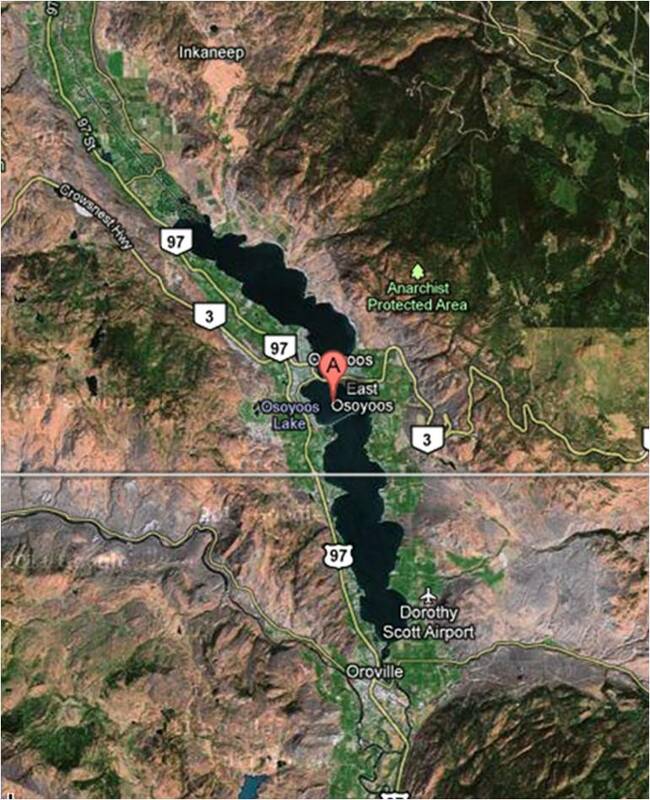 Osoyoos Lake from space, where the distinctions blur between where one jurisdiction begins and another ends. Alex Louie, who filmed the proceedings for the Osoyoos Indian Band, reminded the group that from the indigenous point of view, the international border doesn’t exist. 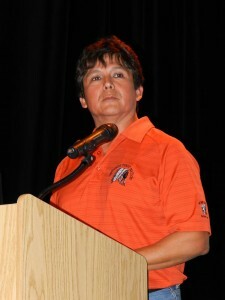 The Colville Confederated Tribes are the same people as the Okanagan Nation. Looking around the room, you could mostly say the same about the residents of Oroville and Osoyoos (the U.S. and Canadian towns along the lakeshore), or even the visiting university and agency people – shared values, shared backgrounds, shared interests. There’s no question that Osoyoos Lake will be healthier if we can take a common, ecosystem-based approach to water quality and water supply problems. Lake levels, flow rates, watermilfoil control, shoreline access and zoning all lend themselves to collaborative processes. On the other hand, we can’t just throw nationhood and politics out the window. “It starts with the water. If you don’t have good water, the plants and animals will tell us we aren’t doing our job…They are an important part of our family – if a place doesn’t have plants and animals, it won’t have humans.” – Chief Clarence Louie, Osoyoos Lake Water Science Forum, September 18, 2011. Welcome to the Salmon Nation. One day into the Osoyoos Lake Water Science Forum and my head is filled with fish. For thousands of years, the Okanagan people fished sockeye here. They are salmon people – with a territory stretching south to Oregon and north and east through the southern interior of BC. We are here in Osoyoos this week to talk about a lot of different issues, but none more symbolic and integrative than the return of the sockeye. Small girl, tiny dog, huge salmon. There will be heavy-hitters from Ottawa and Washington D.C. in Osoyoos next month, but they won’t be wearing dark suits and carrying brief cases. They’ll be listening and talking to US and Canadian locals about the renewal of the Osoyoos Lake Operating Orders, hearing water science updates, and sharing in-season sockeye salmon, apples and pears. I’m really interested in the potential of this cultural and political mixing, and the opportunity to be innovative when you take a bilateral agreement down home. Bringing it all back home: In 2007, locals from the towns of Osoyoos and Oliver (in Canada) gathered with residents of Oroville and other communities just south of the border, joined by leading scientists, politicians, policy makers and agency folks – to discuss international policy for Osoyoos Lake. Every good relationship needs care and communication – including our international co-habitation of Osoyoos Lake, which crosses the 49th parallel. Most Canadians are a bit on edge about the US thirst for water. We want to cooperate, but there is a cautious pragmatism. The Okanagan has relatively low flows, and we rely on irrigated agriculture. On the other side, they have trouble in the Okanogan (American spelling) “keeping up with the Canadians,” who come in droves to buy inexpensive vacation properties. The Americans have irrigated agriculture and water concerns of their own. Then there are those that know no boundaries – the easternmost run of Pacific sockeye salmon in the Columbia are enjoying their second record-breaking year in a row for Osoyoos Lake and the Okanagan River. This has huge significance for the Okanagan Nation, the Syilx people who have relied on and celebrated these salmon for thousands of years.